Harry Potter was first published in 1997, and became a worldwide phenomenon. Then in 2001, it was catapulted even further with the very first film. Now, less than 20 years later, the story of the “Boy Who Lived” is a timeless classic, and that is thanks in very large part to Universal’s Wizarding World of Harry Potter. What began in Orlando as one small but highly detailed themed land has spread to three parks over two continents. In 2014, Universal Studios Japan became the second park to have Harry Potter fever take hold, and while the experiences may look the same, they are completely different. Each Wizarding World has a unique heart to it, but when it comes to the Holidays, Japan’s Wizarding World shines. Japan’s theme parks are unique to begin with. Disney literally invented Halloween in Japan, as well as Christmas. Universal cemented it further, offering things like Halloween Horror Nights and a massive Christmas Celebration. Before then, not a lot of people celebrated the holidays in the country. Now, it’s spreading like wildfire. It’s not uncommon to walk through the streets of Universal Studios Japan and see Cosplayers walking through on any given day. It’s something that is not allowed in America, except at Disney during Halloween. At Universal, you may see Lord Voldemort strolling along, or even Santa Deadpool. Japan loves dressing up, and very special occasions, which is key to why Harry Potter is getting some special celebrations this year. In 2016, Universal Studios Japan announced that they would be doing something that has never been done before. They would be bringing unique celebrations all year long to the Wizarding World. It began with very special wand dueling classes in the first part of the year. During Halloween, it continued with trick or treating during the day, and Spooky Death Eaters at night. While the wand dueling classes and Trick or Treating through Hogsmeade were fun, it was the Death Eaters that really stood out. The Death Eaters, who are some major bad guys in the Wizarding World, would come out and attack the crowd. They would walk through very menacingly, and proceed to scare“guests” and workers in Hogsmeade Village. Heroes from the village would then come to the rescue and they would duel the Death Eaters in a massive on-stage fight, full of special effects. It was clever, and definitely something special that we have not seen here in the states at either The Wizarding World of Harry Potter in Orlando or in Hollywood. Now, as Christmas approaches, Universal Studios Japan is taking their holiday celebration one step further by including The Wizarding World. 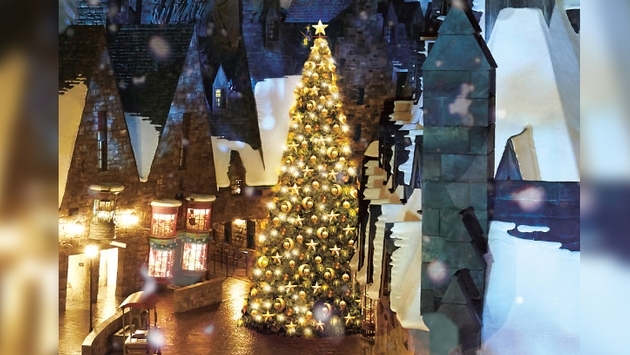 Guests will see the village of Hogsmeade decked out in holiday décor, like wreaths and candles all around the shops. There will be a big Christmas tree in the center of the Village. While that doesn’t sound like anything too special, what happens to that tree is. READ MORE: Is Universal Planning A New Harry Potter Wand Ride? Wizards and witches will be able to cast a spell on the tree that will make it light up! Guests will also be able to enjoy traditional Christmas feasts at the restaurants. While this is something that American audiences have been yearning since the Wizarding World opened, it has yet to materialize. The rumors suggest that Universal and JK Rowling are working on a special after-hours Christmas event that will include the famous Yule Ball, and more. Until then, the Christmas season will shine bright over the Wizarding World, only in Japan.